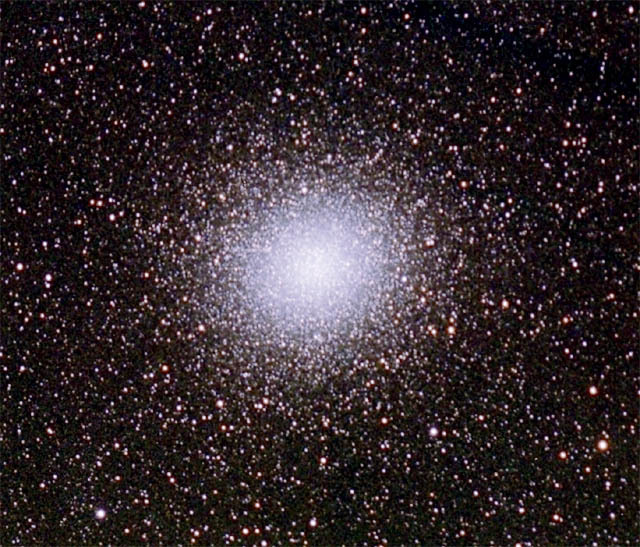 Omega Centauri (w Cen) is the largest and brightest of the 130-or-so globular clusters around our galaxy. At magnitude 3.6, it is plainly visible to the unaided eye, if you are far enough South to see it. It contains well over 1,000,000 stars. Some astronomers believe that globular clusters are the cores that remain of smaller galaxies that were absorbed by our galaxy. Globular clusters are among the oldest known objects in the universe, and are dated to be about 15 billion years old. Similar globular cluster systems have been observed around other galaxies. This image was published in Sky & Telescope magazine Oct-2001 in the article "My Favorite Deep Sky Objects". The Hubble Space Telescope imaged the center of w Cen.